The Moog Grandmother Synth captures the essence of original analogue modular synth designs and packs it into a fun, playable synthesizer key.. 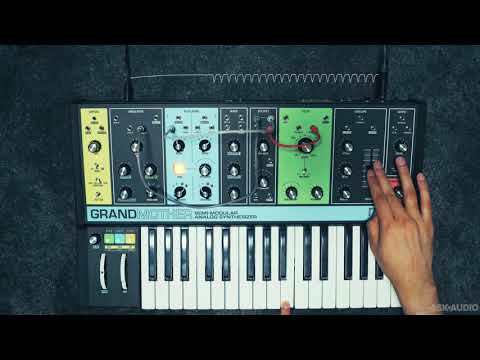 The Moog Grandmother Synth captures the essence of original analogue modular synth designs and packs it into a fun, playable synthesizer keyboard that won't break the bank. 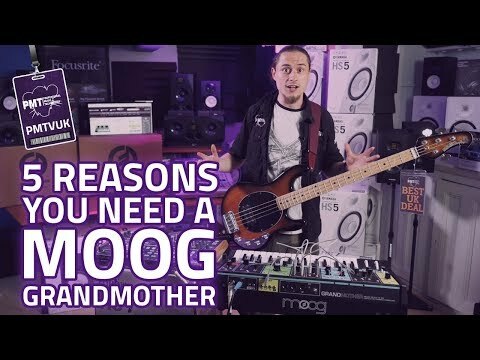 Moog Grandmother encourages new expression through experimentation and sonic discovery - perfect for newcomers to sound design as well as traditional electronic music production setups. It is capable of highly complex sounds and modulation without the need to manually patch parts together. Simply tweak away and start playing! Hardware Spring Reverb can be used to process external sounds from guitars, drum machines, and more. The sonic fingerprint of the Moog Grandmother is characterised by some of Bob Moog's most iconic and successful synth components. Powered primarily by 2 analogue oscillators from the Moog Minimoog, a Mixer section from the CP3, Moog 904 Filter and Moog 911 Envelope Generator, as well as a Moog 902 VCA section. The roots of the Grandmother stem from some of the best sounding analogue synths ever created. All rolled into one powerful package. Additionally, Moog Grandmother features an analogue ADSR Envelope Generator, a patchable 1-Pole High pass Filter, Classic 4-Pole 10Hz-20kHz Ladder Filter and an Analogue LFO with audio-rate capabilities. 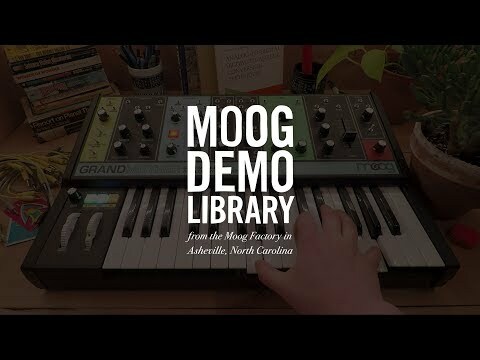 Moog Grandmother also features a built-in arpeggiator, sequencer and spring reverb tank from the old Moog 905, which can be routed for use with external sounds as part of a modular setup. Hook up a Moog Mother 32 or DFAM Percussion Synth for unlimited creative possibilities, all designed to work hand-in-hand in a modular or Eurorack system. Grandmother groups panel controls together by module. Each module is also equipped with a set of modular patch points which greatly extend the capabilities of this expansive analog instrument. With a total of 41 patch points including 21 inputs, 16 outputs and a Parallel-Wired 4-Jack MULT section, Grandmother is ready for anything. Grandmother features an intuitive 3-channel mixer with an additional 1/4” external audio input, capable of handling external audio sources. Grandmother also packs a fully featured Audio and MIDI/USB IN/OUT interface for direct-to-DAW recording and programming. Hook up an external audio source like a Guitar or Drum Machine and run it through Grandmother's powerful filter section with unrivalled processing power. Grandmother’s Left-Hand Controller is home to numerous performance and programming controls including PITCH and MOD wheels, a GLIDE control, and transport controls for the Arpeggiator and Sequencer. The PLAY, HOLD, and TAP buttons provide access to, and control over, the ARP / SEQ module. When recording a sequence, their function changes and they become the (TIE), (REST), and (ACCENT) buttons. Grandmother is designed to behave and function like a traditional analog instrument, but changing keyboard octaves is a useful function for live performance and interfacing with other MIDI equipped devices. The Grandmother's front panel oozes 1980's feel, courtesy of a vintage-style faceplate, knobs and switches that hark back to the glory days of Analog Synth design. Grandmother is kitted out with a 32-note Fatar Keyboard with an expressive aftertouch. Everything feels solid, as you'd expect from the world's most trusted and recognisable synth brand - Moog!